How can you make a scarecrow that will cope with the rain and the wind for several weeks? Is it possible to make a weatherproof or waterproof scarecrow? 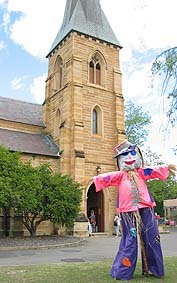 Peter and Sadie Jones faced this problem when they made a giant scarecrow to stand outside the All Saints Church at North Parramatta, NSW. 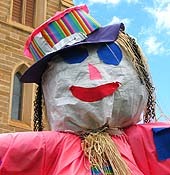 They wanted their scarecrow to stay attractive and colourful for three weeks prior to their Scarecrow Festival. Here are some tips from Sadie about making a weatherproof scarecrow. -- Seal the stuffing inside two layers of waterproof material such as garbage bags or synthetic horse feed bags. -- Securely wire on all loose parts (such as the head and hat) to the main structure to prevent them being blown off in the wind. -- Use 100% nylon Ripstop fabric to make the clothes and features such as eyes and mouth. This fabric comes in a range of bright colours and stays firm and colourful even in rainy weather. It is normally used to make weatherproof clothing or tents and has a fine check pattern woven into the grain of the fabric. -- Use waterproof materials such as unravelled synthetic rope for the hair. This sturdy giant weatherproof scarecrow, made by Peter and Sadie Jones, stood outside the All Saints Church for three weeks without deterioration prior to the All Saints Scarecrow Festival in April 2006. © 2007 - 2014 Make Scarecrows. All Rights Reserved.